After rehab, serving time for DUI (driving under the influence), anorexia, and her endless wild parties with Paris Hilton, Nicole has finally found her place. She has never been as beautiful as she is now with baby Harlow snuggling in her arms. Meeting Joel Madden (frontman of band Good Charlotte) seems to be the start of a new path. Now living with boyfriend Joel and their baby Harlow has given Nicole a new life — a life she may have been looking for all this time but never found during her wild days. When asked about her daughter Harlow, she says, “I owe my baby my life.” Not only has it given her peace, it likewise allowed her father, Lionel, to finally exhale. 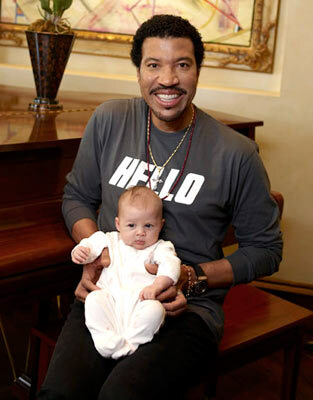 The pictures below will show how ecstatic grandpa Lionel is with tiny Harlow . I believe Nicole finally realized that joy and contentment is best found at home with family rather than in bars drinking with friends. I hope that Nicole’s wake-up call is not short-lived. May Harlow give her the strength she needs as motherhood will not be simple and is definitely no joy ride.